The premier Super Late Model division comes down to two heavyweight contenders with similar resumes. Jacob Goede #72 from Carver (MN) is the two time defending Champion at Elko that returned to his home track after years racing the Regional Touring Series circuit. Goede has won some very impressive races over the years, including an ASA Late Model event at both Iowa Speedway and Bristol Motor Speedway in 2007. He also was the Midwest Tour “Rookie of the Year” in 2009 and won races at I-94 Raceway and Illiana while racing the Midwest Tour. Joey Miller #15 from Lakeville (MN) is looking to take the crown from Goede. Ten years ago Miller was a rising young star in racing, he raced the National ASA Tour and then scored five wins in the ARCA series before making his way all the way up to the NASCAR Craftsman Truck Series and racing for Darrel Waltrip. He scored a Top 5 finish in Mansfield OH in 2006. In his first year back racing full-time Miller hasn’t missed a beat, he has scored five wins and is in contention coming into the final night of racing in the NASCAR Whelen All American Series season at Elko Speedway. Here is the situation – Goede has a 55 point lead. Both drivers will qualify with an opportunity to score 15 points for the winning “Fast Time”, second will get 14, third will get 13 points and so on until fifteenth gets 1 point. Race fans should expect twenty or so of the best Super Late Models in the Midwest and some great racing for the Season Championship in the MN Corn Growers Super Late Models Saturday night September 17th. The Hiway Federal Credit Union Big 8 division will also crown a Champion that night and racing as well in the Pepsi Power Stocks, Genz-Ryan Thunder Cars, Great North Legends, Hornets and Bandolero’s. 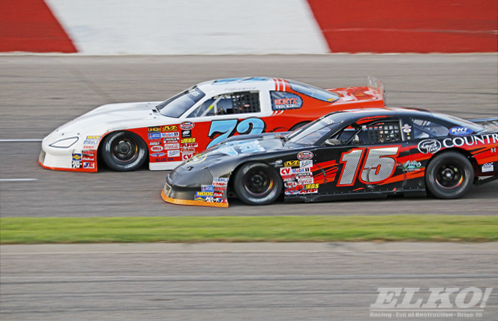 Numerous high profile Midwest tour drivers are expected to enter Elko Speedway this weekend and take part in the Super Late Model Championship. Remember the ARCA Midwest tour is scheduled to race a 125 lap feature at Elko next weekend on Saturday September 24th during the Thunderstruck93 event. *Note— A preview of the Big 8 division season championship is coming up soon.